Check out the SoundGuys Podcast on iTunes! This episode “Is Bluetooth Dangerous NO! Part 1” can be downloaded here. Below is a full transcript of the podcast. Be sure to subscribe to iTunes for more episodes! This is a two-part crossover event with the Android Authority podcast! Check out part 2 of this podcast for a roundtable discussion here! Hello there, and welcome to the SoundGuys Podcast- my name is Chris Thomas, executive editor and resident science guy sans bow tie. After reviewing the Bose Sleepbuds last month, a reader asked me what the potential health effects of listening to what are basically bluetooth headphones for 8 hours every night would be. It’s a valid question, and I’m glad the commenter (Rich D) was willing to put themselves out there instead of just taking what Google says at face value. So is Bluetooth dangerous to your health? No. And that’s it for us here at SoundGuys, thanks for listening! We’re happy that you’re willing to join us twice a month for our podcast, and we’d love to see you…. Hold up hold up. Fine, I know that’s all the subject deserves, but I’m not going to turn people away who genuinely want an honest and complete answer here. Truth is there’s a lot of misinformation out there, and we need to set everything straight. So we’ve brought in some help from our friends in the DGiT podcast network (the Android Authority Podcast) to help us settle, once and for all, why you might think Bluetooth is dangerous, and why it just isn’t. The SteelSeries Arctis gaming headset in black is a Bluetooth-enabled headset. If you do a Google search for “Is Bluetooth dangerous?” you get some worrying results including Bluetooth headphones cause depression, Bluetooth increases the risk of cancer, and wireless tech increases your chance of developing a rare tumor called a schwannoma. All of these incidences sound awful, and they are. But there’s just one problem. But before we talk about that—and we will—let’s talk about why the spreading of such falsehoods is a big deal. Sure, constantly using speakerphone to make calls may be a hassle for you and a headache for the person on the other line, but doing so because you read about the supposed “dangers of Bluetooth” from a dubious source isn’t world-ending. However, repeatedly accepting falsehoods as truth can lead to larger issues. All right. Let’s take a close look at those search results. On the first page, you’ll find companies pedaling products to “protect you from the dangerous radiation,” and trustworthy sources turning the other cheek to this fear mongering. Stuffed between these vendors selling you trinkets that wouldn’t work even if radio frequency electromagnetic radiation (or RF EMR) was dangerous—is a single article by Livescience that whispers truth. The dangers of Bluetooth are nonexistent, and anyone who says otherwise is wrong. That said, there are two accessible articles of interest. First, let’s talk about CNN. CNN wrote a piece called “Apple eliminates headphone jack from iPhone 7: Harmful to your health?” The article on the issue addresses the hot-button issue of ditching the headphone jack and uses the Apple AirPods to demonstrate the potential dangers of of RF transceivers, categorizing the use of wireless earbuds as “a decision that could impact your health,” labeling RF EMF as potential carcinogens. Many people use Bluetooth to listen to music, but even in a crowded area it can’t harm you. The well-adapted appeal to logos cites a partial report whereby mice and rats were exposed to RF and later developed tumors. And you know what, an initial reading of this would incite fear in anyone. Tumors are scary, cancer is devastating. But what this boils down to is a misinterpretation of the facts. And as any photographer or journalist will tell you, it’s all about framing. In 2016, the U.S. National Toxicology Program (NTP) drafted findings of studies that examined the effect of non-ionizing radiation on rats and another with mice. The animals were exposed to CDMA or GSM cellular radiation, which is not technically Bluetooth. Though both cell phones and Bluetooth use the same type of non-ionizing RF EMF, the difference comes down to power levels. All exposures began while the subjects were in utero and occurred for nine hours, seven days a week. Two years later, a small number of the rodents exhibited tumors. But this was after the rats were exposed to 2-4 times the allowed limit over their entire bodies. This doesn’t stand as proof of anything relevant. But we’ll let Jonathan take a deep dive into the science of it all. these studies are being taken at face value, without a firm grasp of what the results mean or even what questions you should be asking. The point is that these studies are being taken at face value, without a firm grasp of what the results mean or even what questions you should be asking. Like, for example, is that kind of exposure even possible for a human being? Because it isn’t. Ok, so back to the search results? Well, Consumer Reports addresses the same issue in two articles. The more recent one discusses radiation emitted from Bluetooth devices, and the 2015 article questions whether or not cell phone radiation causes cancer. Both, however, avoid taking staunch positions against this nonsensical, sensational news. Rather, they posit that “potential harm from exposure to radiation from devices is far from certain…” No. No, no, no. It is certain—certainly not harmful. Though both articles seem to arrive at a logical conclusion, each use a crutch called false balance. We know these devices aren’t harmful, there’s no benefit to giving those that disagree a platform—but it happens often in journalism because many writers are afraid to take a definitive stand on issues where there may be disagreement. All right, all right. At this point, you’re probably asking why. Why is this information even being spread if all it’s doing is instilling a false sense of fear in us? Well, each study, each bread crumb, came from a loaf. The loaves in question? Astroturfers. I’m going to let Joe Hindy from the Android Authority Podcast explain. Astroturfing is the practice of corporations or political groups disguising themselves as spontaneous, authentic popular movements. It’s basically fake grass roots, that’s why they call it “Astroturfing.” It’s a very funny, very clever name. 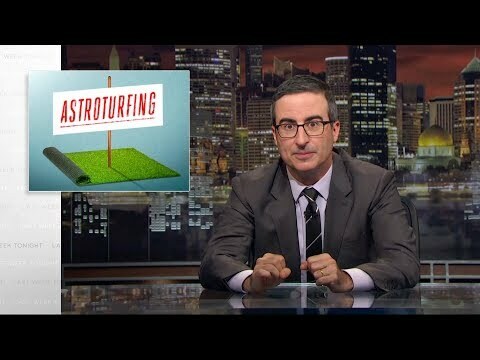 Oliver cites groups like “Americans Against Food Taxes” as an example of Astroturfing. You see, the group was started by the food and beverage industry in order to take out ads against proposed beverage taxes on things like soda. Such taxes would eat into their bottom line and make their products less palatable to the general public, kind of like what they did when they started taxing cigarettes. The companies responded to these new taxes by making ads that look like normal, everyday people are against them to try and persuade you to go with the crowd. Except the crowd doesn’t actually exist. People care about soda taxes, sure. But nobody cares enough about soda taxes to create grassroots movements, raise money, and take out ads on national television. It’s all a ploy. Astroturfers employ is setting up non-profit organizations in order to push their agenda. Often those non-profit companies, which are funded anonymously by companies with something to gain, will employ legal experts, and scientific experts in order to back their claims. And that’s where we run into some trouble with Bluetooth and its supposed brain-melting properties. In this case, some non-profits, which we’ll talk about in just a little bit, have taken it upon themselves to fill an information void. When Apple and others decided to ditch the headphone jack, it signaled to the industry, and to consumers, that Bluetooth was on its way in a big way. The problem, if you want to call it a problem, is that at that time there weren’t a lot of information sources out there that definitively said whether or not bluetooth is harmful. These groups began spreading stories that Bluetooth may be harmful to your health without any actual scientific evidence to back it up very shortly after this event, though they’d been doing the same for cellphone radiation and WiFi since at least 2009. People, worried as we naturally are when faced with potential threats, began searching for information on Bluetooth in relation to their health, only to find the same information that led them to search for that stuff in the first place. It’s a vicious and malicious cycle of misinformation. And now, here we are. There is a swath of bad, poorly researched information out there for Bluetooth and its effects on your health and, well, our society scares easily these days. It’s a perfect storm for fear, uncertainty, and doubt. I’ll give credit where credit is due, these groups are doing an excellent job making this non-problem feel like a real problem. The motivations of these groups isn’t 100% clear, except to promote the fear that non-ionizing radiofrequency electromagnetic radiation causes all sorts of bad things to happen to you. Maybe they want to sell you some organic, farm-to-table 5G or something. But the groups behind the effort share some tactics with the anti-vax movements, astroturfers, and other anti-science movements, so you know they may not be the best source of scientifically-vetted information. This all brings up many questions, but the most important is why this spread of misinformation not illegal? Well, technically, it is if you cross certain lines. For example: doing fake reviews for money is a form of astroturfing and one the FTC frowns down on with the power of law. It’s why we add disclaimers to our reviews, site pages, and best lists. the rules for truth in general are a lot less stringent and, therefore, that makes it easier to spread nonsense without fear of serious consequences. Most astroturfing laws, in the United States anyway, cover truth in advertising, but the rules for truth in general are a lot less stringent and, therefore, that makes it easier to spread nonsense without fear of serious consequences. The other issue is that you have to prove companies are astroturfing before the government actually gets involved. Unfortunately, you can’t use common sense for this a lot of the time. Everybody knows that inhaling smoke of basically any type can cause cancer, but scientists had to prove it before we could sue the pants off cigarette manufacturers for lying to us about it like they had been for decades. In other words, it’s complicated; and the more complicated something is, the easier it is to exploit a loophole and keep it nice and legal. And up until now, all we’ve done is say that these groups are wrong. But we haven’t proven anything. So let’s listen, as my Android Authority podcast friend Jonathan Feist drops some science on you. Like cellphone radiation, microwaves and WiFi, Bluetooth is what’s called non-ionizing radiofrequency electromagnetic radiation. That “non-ionizing” bit at the front is the important bit here, and that’s because non-ionizing radiation lacks the ability to change the properties of atoms. When you hear the word “radiation,” you’re probably thinking of plutonium, gamma rays, and other super nasty stuff – or super cool stuff, if you’re into comics. However, all those examples belong to a class of radiation called, you guessed it, ionizing radiation. These forms of radiation change the properties of molecules by knocking electrons out of the atoms. When humans come in contact with this type of radiation, the molecules that compose our DNA can become ionized, or, change properties. When that happens, errors can happen, or instructions get left out when the cells reproduce, which can cause tissue damage, or even tumors. Sorry, there are no confirmed cases of superpowers. Bluetooth, cellphone signals, and WiFi all emit a class of radiation that is non-ionizing, meaning they can’t change your DNA, or cause any of the horrible things ionizing radiation would. While devices like microwaves use an overwhelming amount of this power to cook food, all of our smart devices use only a tiny fraction of the amount of energy microwaves do. Additionally, this type of radiation loses power extremely quickly. Every time you double the distance away from you, the power drops to one quarter of its original strength. For the nerds at home, yes, this is the inverse square law in action. From a user perspective, it should not be ignored that Bluetooth operates on the same open 2.4GHz radio frequency band as Wi-Fi and many other consumer wireless technologies. Your WiFi router, toy drone and even your baby monitor all also operate in this range at varying power levels. For clarification, your microwave likely operates at 2.45GHZ, while your other electronics are anywhere in between 2.40 and 2.4835 GHz. The FCC allows smartphones a maximum of 1.6 watts per kilogram SAR (short for specific absorption rate), meaning that all phones certified for use in the United States must emit less than that to be certified by the government. In the EU, that number is 2W/kg. If you’re comparing those numbers to your average microwave, your phone is less than 1/600th as powerful. Now let’s compare this to a normal set of Bluetooth headphones you and I use at home. These are class 1 bluetooth headphones that might emit 100mW of energy when you’re on the phone: that’s 1/12000th the amount of the power your microwave pumps out. You’re not going to cook your brain with that amount of power. The nature of the broader 2.4 GHz range is that it has the ability to excite molecules within water and fats, this is why it works so well in the microwave. This is also why you may have experienced poor connectivity when it’s raining outside. As the 2.4 GHz range excites water, it brings it to a boil. Now, your headphones may be 1/12000th the power of your microwave, but keep in mind that your Bluetooth antenna is omnidirectional, meaning it spreads that 100 mW evenly in all directions – Effectively speaking, it would be impossible to put enough pairs of headphones close enough to a glass of water, or your head, to cause the water to boil. Now, you may have read all sorts of scare material about a study performed by the National Toxicology program back in 2016. However, there were numerous problems with that material, namely the fact that humans tend not to use phones that bathe their entire bodies in 2-7 times the legal limit of cellphone radiation for 9 hours a day, and that the findings had a significant margin for error. One of the peer reviewers even noted that the power level calculation would be 14%, meaning that even strong correlations in findings would still be suspect. The evidence for an association between cellphones and cancer is weak. And so far, we have not seen a higher cancer risk in people…. At best it might be a weak carcinogen. … if in fact it is a carcinogen. We’re not going to touch the more insane claims like cell phone radiation causing or exacerbating Autism, ADHD, or other conditions, but I hope you’re beginning to see how ridiculous the notion of Bluetooth causing cancer is. It simply lacks the power and physical properties needed to cause you harm. So where do we go from here? How do you trust what you read online? Is there anything that can be done to avoid falling prey to these groups? Let’s bring it back to Chris for the answer. And the answer is “Yes,” actually. Here’s what you can do: Support your local and national news outlets. No, I’m not talking about cable or TV news, I’m talking the big ones with a strong editorial board like the Boston Globe, New York Times, and Washington Post. Also, for the love of God, avoid the op-ed pages like the plague. You might not know it, but most of these big newspapers have a fact-checking department that labors over each story to make sure everything is correct. When one of these papers issues a retraction, it’s because they want you, the reader, to be well-informed. Making mistakes is human, but it takes a grown adult to realize that when you’re wrong, you make it right. That’s why you see the Associated Press retract tweets all the time with really tiny edits. Journalists care that truth is documented. The process of fact-checking is far more involved than you might think. For example, fact-checkers often follow up with interviewees to see if the location, context of an answer, or intent behind a quote was correct. Crafting a piece of journalism takes a lot of time, effort, and eyes… as I’m sure it’s annoying as hell to my colleagues that I’m still waiting on a comment for the story that drove this whole podcast in the first place. Many of these outlets rely on the trust of their readers, so the companies invest heavily into making sure that trust is never willfully violated. While the criticisms levied against journalists are usually wildly overblown, when lazy or complacent writers rush a story out without a fact-check, or use a sensational headline, the readers are shortchanged. Burn them enough times and they start to wonder if that outlet really is a purveyor of news, or just something that looks like it. Some outlets live or die based on how fast they can pump out content, and these outlets are the ones you should avoid. If you’re looking at a site that you’re unfamiliar with, see how they print retractions, or updates. Look to understand how they handle things when they’re wrong. A good news source will have a retraction policy in place to handle even minor screw-ups. If you’re a young or aspiring journalist, I beg you to seek out a mentor, or education program to develop the skills you need. Writing a news story is so much more involved than what happens at SEO mills, and it’s essential that everybody learns this. By relying on trusted sources of information to report the news, you can reduce the risk of falling prey to huckster and scared citizen alike. So, feel a little better? As a father, I understand the impulse to look at everything as a potential threat to my small child, but the truth is it just isn’t powerful enough to cause problems. The science is pretty conclusive on Bluetooth, the alleged effects are all bunk, and you can rest at ease. Bluetooth is safe, even if you listen for several hours a day. Anyways, that’s all for us here at SoundGuys and AndroidAuthority, and we’re ACTUALLY signing off this time. I know this was a long one, but we want to make sure you have access to the best information possible—so if you liked this episode please be sure to leave us a review on itunes, and drop us a like, comment, or subscribe if the service you use supports that. Since this is a crossover episode, you should check out the AndroidAuthority podcast as well if you want to hear us get a little more real about all this. There’s a link in the description below. Read the latest coverage of smartphones and wireless tech on Androidauthority.com, and definitely don’t skip out on visiting SoundGuys.com for all your personal audio needs. Feel free to hit us up on twitter or instagram, both @realsoundguys. From all of us here to you, happy listening!